Apple’s newest MacBook is undeniably slick. But with its single port and a processor that’s far from super-charged, it’s also got a few potential pain points. The first reviews are just coming in, and it seems like a shoo-in for Laptop of the Future. Just maybe not quite yet. Here’s a quick tour of the most important questions and their apparent answers, according to the reviews that are out there so far. Design? Dope as hell but you knew that already. Performance? This is not a Retina MacBook Air, not by a long shot. It can handle internet browsing and light use just fine, but start editing photos and video and it starts to chug some, and chews through battery. That new keyboard? Weird at first but easy to get used to. Battery life? Not quite the 10 hours it’s rated for and as low as five or six, especially if you are pushing the processor. One USB Type-C port? Welcome to dongle hell. Price? High. Too high? Too high. All in all, the new MacBook has its flaws, but so did the MacBook Air when it came out in 2008, and just look where we are now. We’ll let you know more when we get our hands on one soon, but in the meantime here are some bits from the reviews already out there. In almost every case, the Internet has replaced our computers as the center of our digital experience; our laptops are just terminals of access, particularly suited to a certain set of tasks. More than any laptop I’ve ever used, the MacBook embraces that: It does a few things as well as it can, and leaves the rest to the Internet. It’s running out a little bit ahead of consumers, but it’s blazing the right path. ... Much like that first Air, the new MacBook is for the future. It’s a vision of our next computer, the one we’ll buy when our Airs or ThinkPads can’t keep up anymore. The MacBook is a work in progress: The processor and the battery will improve, and the price will drop. It won’t take long. The future’s getting here faster than you think. You are really, really going to want this laptop, even though it’s relatively expensive, starting at $1,299. It’s easily the most impressive laptop I’ve seen since the original MacBook Air. It’s almost unbelievable in every regard. How did Apple make it so thin? What dark magicks make this trackpad work? Is it really going to be fast enough? Why is there only one port? Every one of those questions has an interesting answer, and the mere fact that a laptop can still engender this much intrigue in 2015 is remarkable. ... [But] you see, the problem with the future is that it isn’t here yet. Instead we live in the now, and the now doesn’t have the ecosystem of adapters and wireless peripherals I need to use this laptop with its single port. The now doesn’t have the right processor to power through the apps I need without ruining battery life. And right now, this laptop is far from cheap at $1,299. 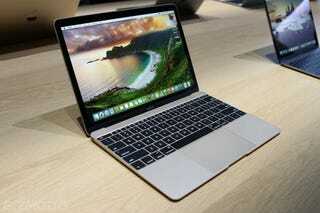 It’s nearly impossible not to be seduced by this MacBook’s beauty, its dazzling screen and perfect trackpad. But don’t give in. Like theoriginal MacBook Air, introduced in 2008, there are too many key compromises—in battery life, speed and port access—for the early-adopter price. Much like the original Air, the new MacBook is expensive, and it’s not for everyone. In particular, it’s for well-heeled shoppers who demand the most portable machine possible, and who also don’t want to compromise on screen quality. That might not be persuasive to would-be Windows users, who have several compelling alternatives, many with equally sharp screens and a bigger selection of ports. But for loyal Mac fans who wouldn’t dream of switching, the new MacBook is by far the lightest-weight machine in Apple’s lineup, especially with this caliber of screen. It’s not for everyone, especially not right now, but if it’s anything like the Air, it might one day become the standard. Apple’s new MacBook seemed like a shift so dramatic that it was bound to cause some discomfort when it was unveiled on stage in March in San Francisco, but in practice the big changes are far easier to embrace than you might expect. It’s true that for users who treat their notebooks as their sole computers, and who like to plug a lot of things into those computers as a result, this probably isn’t the best option. But for people looking for a mobile Mac to complement their desktop machine, and for those who aren’t sending their whole day on their Macs for work (meaning likely the vast majority of general consumers), this is a future-oriented notebook that is just as effective in the present, too. The most important thing about the new MacBook, to me, isn’t necessarily what it is now, but what it represents. In five years, the sea of MacBook Airs and MacBook Air-style machines we see now at Starbucks will be replaced by machines that look more like the new MacBook. My dream machine would have everything the new MacBook has but in a slightly larger size with one more port. But if you’re ready for an all-wireless future, the MacBook’s sheer portability and utility per square inch make it worth the splurge. The MacBook is a gorgeous piece of hardware. The Retina display is excellent, and I’m really loving the Force Touch trackpad. The keyboard is more of a hit-or-miss affair; if you’re someone who is particular about your keyboards and spends a whole lot of time typing, it may be a deal-breaker. This is a laptop that will serve its audience well. That audience is one that prioritizes size, weight, and stylishness over compatibility and ports and computing power. I’d say that this isn’t a laptop for power users, but I don’t think that’s true—there are whole classes of “power users” who don’t actually need more power than the MacBook can provide. That’s the thing about the new MacBook: It doesn’t cater to exactly the same audience as any existing Mac. It’s a really good laptop—assuming you can figure out how to make USB-C make sense for you—and yet its size, weight, and overall minimalism give it an iPad-like persona. The thinking behind it is a different, more subtle way of mixing PC and tablet than all those other devices that try to be both at once. But like the original 2008 MacBook Air before it, this specialty Mac could also be a blueprint for the next generation of mainstream notebooks. With the new keyboard and trackpad innovations, lust-inducing industrial design, and impressive downsizing of internal components, the MacBook feels like a an important next step in the evolution of portable computers. But this machine isn’t for everyone, particularly those who expect extremes from their devices. Still, if you prioritize style, need something ultraportable, and don’t mind trading power for a crisp and clear Retina display, then the perfect computer may have arrived. If money is no issue for you, you want a significantly smaller laptop and you don’t mind being limited by a lack of ports, then maybe upgrading to the new MacBook makes sense for you. But if you rely on USB ports and SD card slots, this MacBook’s single port for charging, storage transfers and other functionality will really bug you. In a few years, we may look back on this laptop’s missing USB ports like we look back on the original MacBook Air’s absent Ethernet port or missing optical disk drive[...] thinking, “Who needed that?” We’re just not quite there yet.